The Guidelines for Dharma Sharing protect each other and offer direction towards clear and compassionate communication. All that arises is confidential. What is said here, stays here. Confidentiality secures the safety of the group and helps avoid gossiping. After Dharma Sharing, if we want to talk with someone about what they said in the group, we first seek their permission by asking if it is ok to do so. Sometimes a person does not want to talk more about what they said and this is a respectful way to honour his or her space. Speak from experience and avoid theoretical discussions. Topics emanate from our life and practice. It is best to avoid discussions which are theoretical rather than experiential. Theory can be found in many books, which can be read during the time we are not together as a Sangha. 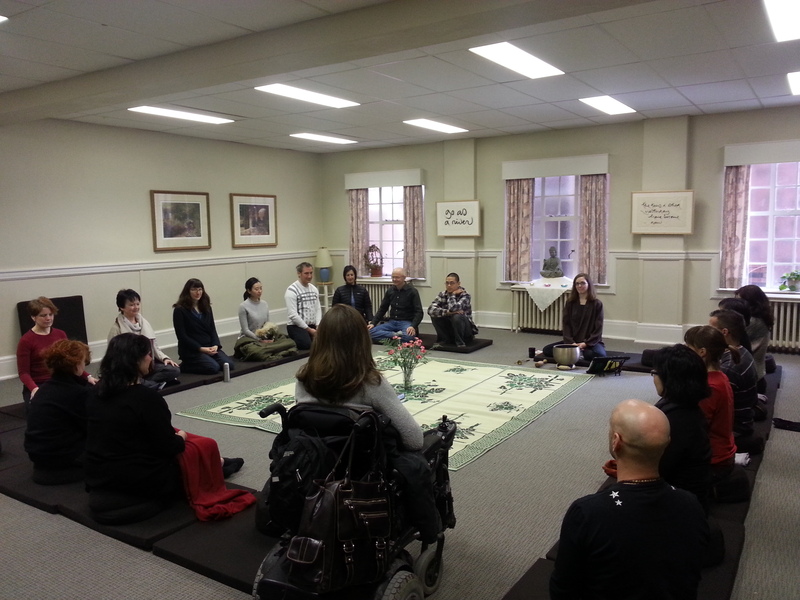 Our time together as a Sangha is precious and we get the most benefit when we learn from each other’s experiences. During Dharma Sharing, we may share our practice from the past few weeks, any insights or difficulties we might have had, make a comment about how the reading or Dharma talk relates to our experience, or ask a question. Indicate our intention to speak by bowing, and indicate we have finished speaking by bowing. Before speaking, we make a “lotus” with our hands (we join our palms together) and bow. When we bow, we are signaling to others that we would like to share. The Sangha bows back acknowledging that they are ready to listen deeply. When we are finished, we let the Sangha know by bowing again. During the time in between, we have the space to speak without interruption, which helps to creates a safe and harmonious environment. Practice loving mindful speech and watering positive seeds. Speaking from the heart about topics that emanate from our life and practice includes speaking with awareness in a way that could be of benefit to others as well as ourselves. For example, we can speak with kindness, in a voice that is clear and loud enough for everyone to hear, and connect with others by making eye contact and smiling from time to time. We all benefit from hearing each other’s insights and direct experience of the practice. We are aware that the knowledge that we presently possess is not changeless, absolute truth. We keep this awareness while we speak so that we are not caught in our ideas and opinions, but rather to humbly offer the best of ourselves. We try to speak in a way that is truthful and waters positive seeds in others. Many of us have ideas about what it means to be “honest”. Though what we say may be correct from one point of view, it may not be the truth. The truth is something that has the capacity to reconcile, to give people hope, and to give people happiness. If answering a question, speak from experience. If someone asks for advice and a practice that we have worked with comes to mind, it is fine to share our experience rather than telling someone what he or she should do. In general, it is helpful to always use the word “I” instead of the word “you”. Speaking from our own experience helps to prevent someone from giving advice that they cannot follow themselves. Share with the whole circle. Whatever we share is for the benefit of all those present. We do not engage in cross-talk with another participant. If we ask a question, we ask the whole group and if we answer a question, we speak to the whole group and not just the person who asked. If we ask a question, we should not expect an answer straight away. Another topic may be addressed first and only when and if someone feels ready to address the question asked, will it be addressed. Practise taking three mindful breaths after someone has shared. Our speech is the fruit of our practice, a response from within. It is helpful for the atmosphere of Dharma Sharing, when participants take three mindful breaths before speaking, to allow time for the previous person’s speaking to be fully received and to feel gratitude for their contribution. If we are anxious to share, this gives us space to come back to our breathing and ask ourselves: “Why am I in a hurry to speak? Will what I say nourish others in the Sangha? Will it nourish me? Would it be better to speak to someone individually about this matter?”. If we are in a hurry to speak, we try to calm ourselves before we share. Refrain from speaking a second time until everyone has had a chance to speak. This ensures an opportunity for everyone to speak and provides a space where we can benefit from each person’s wisdom. We are encouraged to speak mindfully, not too much and not too little, in accordance with the number of participants. Near the end of the time, the bellmaster may offer an opportunity for those who have not spoken to do so if they wish and may address any unanswered questions. Practice deep listening. Even though we have the intention to listen deeply, our mind may wander. Perhaps we are agreeing, disagreeing, feeling agitated, wanting to respond, drifting off, etc. If we are mindful of our thoughts and inner dialogue, we can choose to come back to being present with the person who is speaking. Many people in the Sangha use this as training to become more attentive listeners for family and friends.